This is a huge consideration when shopping for vinyl replacement windows, but it receives surprisingly little attention. The exterior trim or lack thereof will affect the appearance of your house for years to come. It will determine whether your new vinyl windows look like they belong on your house or look like a cheap add-on. The integrated flange creates a wide flat exterior frame around your vinyl windows. The decorative flange simulates the look of wood molding. One of the most common and least expensive options is what I call the integrated flange. It's a 1 to 4 inch wide strip of vinyl that's a built-in part of the window frame. In other words, the frame and trim are all one integrated unit. The flange hides the rough edges of the installation much like the plastic plates that surround a light switch. The flange is sealed to the exterior of your house with caulk. Since the flange and the frame are integrated, there is no need to attach the two parts. That means there's little risk of seams wearing out or air leaking in around the windows. The main disadvantage of the integrated flange is its appearance. Since the flange is made of the same vinyl as the rest of the frame, you're limited to the same color choices for your trim that you get with the rest of the window. This usually means white or almond and nothing else. Also, the flange and the frame together can be very wide, leaving your windows with a giant white or almond border around them. The width of this border can be jarring, especially on smaller windows like the ones commonly found in bathrooms. We found the overall look of the exterior flange to be cheap and unprofessional. Houses that have it seem to cry out "I had vinyl replacement windows installed and they don't match the style of my house." 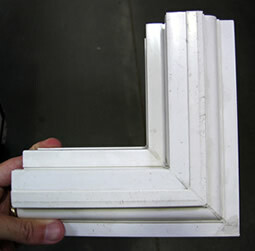 Another vinyl window trim option we encountered is what I'll call the decorative flange. It's a more stylish variation on the integrated flange. It too is made of vinyl and integrated into the frame. But instead of being a simple flat strip, it is contoured to look like a piece of wood molding. It looks pretty sharp, but you'll probably be limited to the two standard color choices of white or almond. Also, it may be hard to find. Only one of the five companies we considered offered this option. Installing the exterior coil wrap. Another major option to finish your vinyl windows is called coil wrap. Coil wrap is a thin sheet of aluminum that has been coated with vinyl on one side. It comes in a variety of colors from off-white to forest green to bright red. It usually has a faux wood grain texture stamped onto it. I asked several salesmen why it was called coil wrap, but they couldn't tell me. The best I can figure is that it comes coiled up in a box until it is wrapped around your window frame. Anyhow, after your new vinyl windows are put in place, the installer uses a special device to bend the coil wrap into a "U" shape. Think of it like a hollow 2x4 piece of wood. 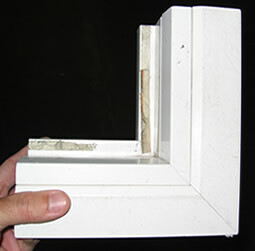 The formed coil wrap segments are then placed on all sides of your new windows. The coil wrap is usually about two or three inches wide (they can pretty much make is as wide or thin as you want). It sticks out from the surface of the house by about half an inch. It attaches to the vinyl window frame and the exterior of your house with caulk—a LOT of caulk (more on this later). The end result is that your windows look like they have wood frames around them. We chose an off white color that matched our garage door and the rest of the trim on our house. This offset the stark white of the vinyl frame and resulted in an appearance that we are very happy with. It looks far better than the old windows which had a thin strip of aluminum that met the stucco of our house with no decorative border. The main down side of coil wrap as far as I can tell is the large amount of caulk used to install it. Caulk is prone to collecting dust over time and it can be difficult to clean if it gets dirty. Also, the large bead of clear caulk that surrounds our coil wrap could pose a problem if we ever want to paint the outside of our house. Another potential problem is that the coil wrap frame could be easily dented since it's a hollow piece of thin aluminum. In any case, we're happy we chose coil wrap for now. In our experience, most companies offer just one type of trim, so the style you want may determine the company you choose.